Agatha Glitterwing is having a Craft Club in the Friendship Forest, so Goldie the cat brings Jess and Lily to visit. The girls have a good time making jewelry, but soon Snippit the crow is causing mischief, throwing nuts and sticks at the crafters. Soon, Snippit casts a spell on poor Chloe the otter, and she begins to join the crow in his mischief. Consulting the reversal spell that they found in Mrs. Taptree's library, Jess and Lily start to find Chloe's favorite things. One of them is a necklace she made, but it has gone missing. Thanks to Mr. Cleverfeather's invention,it is found in a huge pile of shiny objects that Snippit has taken from many members of the community. The girls also manage to find a water lily that Chloe likes to eat, and ask her friend Violet about her secret and favorite place. Everyone is relieved when Snippit's evil spell is reversed. At the end of each of these books, there is a short one page article on facts about the main animal. This is a nice inclusion of some nonfiction information. There is often also a puzzle or activity of some sort. Snippit is a particularly evil minion of Grizelda's, since he raises thievery to an art form, stealing shiny metal objects from nearly everyone in Friendship Forest. It is good to see the members of the community working together to get the items to the proper owner once the rather scatterbrained owl scientist and inventor, Mr. Cleverfeather, manages to locate all of them. 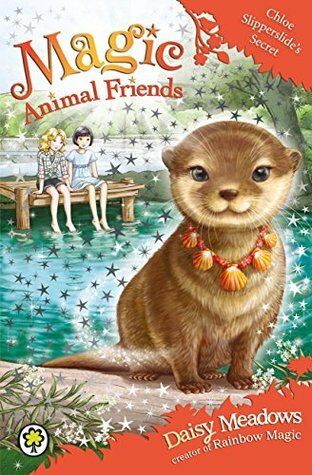 The animals of Friendship Forest all are supportive of one another, so this serves as a good example for young readers. Since this series currently has about 14 books in it, getting the next book is an easy way to satisfy readers who have already finished the new The Magical Animal Adoption Agency books by Kallie George or the seven book Animalmagic series by Holly Webb. Be prepared to have beading supplies ready so that fans of Agatha Glitterwing can make their own creations to wear! Daisy Meadows - Daisy Meadows is the pseudonym used for the four writers of the Rainbow Magic children's series: Narinder Dhami, Sue Bentley, Linda Chapman, and Sue Mongredien. Rainbow Magic features differing groups of fairies as main characters, including the Jewel fairies, Weather fairies, Pet fairies, Petal fairies, and Sporty fairies. Narinder Dhami was born in Wolverhampton, England on November 15, 1958. She received a degree in English from Birmingham University in 1980. After having taught in primary and secondary schools for several years she began to write full-time. Dhami has published many retellings of popular Disney stories and wrote the Animal Stars and Babes series, the latter about young British girls of Asian origin. She lives in Cambridge, England with her husband and cats. Sue Bentley was born in Northampton, England. She worked in a library after completing her education and began writing for children once her own began school. Bentley is the author of the Magic Kitten, Magic Puppy, and S Club series and lives in Northamptonshire. Linda Chapman has written over 50 children's fiction books, including the following series: My Secret Unicorn, Stardust, Not Quite a Mermaid, and Unicorn School. She lives in Leicestershire with her husband and daughters. Sue Mongredien was born in 1970 and grew up in Nottingham, England. She has published over 100 children's books, including the following series: The Adventures of Captain Pugwash, The Magic Key, Frightful Families, and Oliver Moon. She has also contributed many titles to the Sleepover Club series and written picture books. Mongredien created the Royal Ballet School Diaries under the pen name Alexandra Moss. She lives with her family in Bath, England.